Extron is introduces two high resolution TouchLink Touchpanels. The TLP 1000MV and TLP 1000TV are fully configurable 10-inch touchpanels featuring thin bezels. The larger, 1024x600 resolution touchscreen surface provides ample room for sophisticated controls and graphics. The new touchpanels incorporate an MTP – Twisted Pair receiver, which accepts either S-video or composite video input over standard Cat-5 type cable, enhancing connectivity and streamlining cable management. Power over ethernet allows the touchpanels to receive power via the ethernet connector, eliminating the need for a local power supply. The TLP 1000MV mounts on a wall, lectern, or other flat surface, while the TLP 1000TV sits on a tabletop or on a VESA standard mount with an optional adapter. Liberty AV Solutions is now offering HDMI cable organized within four product groups designed to meet the growing needs of a diverse marketplace. Offered in a variety of lengths, gauges, and colors, the Liberty family of HDMI cable exceeds HDMI spec requirements in many cases, is UL listed, and supports multiple data rates. The E-HDSEM -M and E-HDSM -M Series both are CL2 and FT4 rated for in-wall use, and feature 0.5- to two-meter construction in 30 AWG sizes, threeto five-meter construction in 28 AWG sizes, and 6-meter and up construction in 24 AWG sizes. AKG’s Perception Wireless System comes complete with bandwidths up to 30 MH z and low-current transmitters. The Perception Wireless is designed to accommodate musicians and entry-level audio technicians, although it has the capabilities to handle difficult audio setups with up to eight channels per band. The Perception Wireless Series consists of a vocal set, with the handheld transmitter HT 45 featuring a dynamic cardioid capsule; the instrumental set, which comes with the pocket transmitter PT 45 plus instrument cable; the sports set with the pocket transmitter as well as a C 544 head-worn microphone; and a presenter set, complete with the PT 45 and a CK 99 L lavaliere microphone. Yamaha’s M7CLv3.5 and File Converter software application, available for both Mac OS and Windows platforms, converts file formats between PM 5D and M7CL as well as M7CL and LS 9 consoles, providing data compatibility between consoles. A PM 5D or LS 9, for example, can be brought in to replace an M7CL, using mix data originally created on the M7CL. The File Converter function will also convert parameters for multiple scenes. The firmware contains numerous new functions that will further enhance operation and efficiency of the M7CL console. New alternate functions for the selected channel have been added that can be assigned to user-defined keys for even greater efficiency. RTI’s XP-3, featuring a 532-MH z i.MX processor and 128 MB of nonvolatile flash memory, improves the user experience by providing a higher degree of control and automation than a standalone remote control. The processor features an astronomical time clock for timebased events, a built-in ZigBee RF transceiver to allow bidirectional communications with compatible RTI remote controls, and access to the same library of drivers utilized by all RTI XP series processors. Soundcraft’s Si Compact Series is a power-packed range of digital consoles that brings all the experience of Soundcraft’s digital mixing platforms for tour sound, corporate event, house of worship, and theater applications. With full DSP functionality built-in to a small-footprint chassis, the Si Compact provides up to 40 inputs to mix in three frame sizes, the smallest of which is also rack-mountable. Motorized faders with patented Soundcraft FaderGlow operate on two layers, but the main difference from similarly priced mixers is the provision of a full encoder set for all the functions on a channel, from input gain through EQ and dynamics to bus controls. With Aviom’s FK 6 and SK 6 mounting accessories, AllFrame I/O boxes can be installed in existing floor pockets or used as drop-boxes on stage. At the center of the AllFrame Multi-Modular I/O system is the F6 modular I/O frame, a multi-purpose network frame with six field-configurable I/O card slots and integrated Cat-5e and fiber optic connectivity. The F6 can be outfitted to meet the audio I/O requirements of nearly any application. Additional mounting options for the F6 include on-wall or in-wall mounting using a standard NEMA Type 1 enclosure or rack mounting, with connectors facing the front or rear, using the RK 6 rack mounting kit. The AllFrame system offers users multiple connectivity options via modular I/O cards. Calrec Audio’s Artemis is an audio console with routing and processing power that belies its modest footprint. Artemis is based on the Apollo platform and, like Apollo, relies on the most advanced Calrec technology: Bluefin2 for processing and Hydra2 for routing. Bluefin2 enables Artemis to provide substantial resources at multiple sample rates. Running at 48 kHz, Bluefin2 gives Artemis up to 680 channel processing paths, 128 program busses, 64 IF B/track outputs, and 32 auxiliaries. Wohler Technologies’ AMP 1-E8-MDA -3G is the company’s first 1RU , eight-channel audio monitor to support 3G transmissions as well as a comprehensive array of Dolby audio sources. The AMP 1-E8-MDA -3G is the latest in Wohler’s E8 series of multi-format, eight-channel monitors, bringing together an array of features for multichannel digital and analog audio monitoring in a compact 1RU chassis. The AMP 1-E8-MDA -3G is a high-quality audio monitoring solution capable of monitoring audio from Dolby E, Dolby Digital, Dolby Digital Plus, 3G, HD -SDI , SD -SDI , AES /EBU, and analog signal sources. Planar Systems’ Clarity Matrix LCD Video Wall System measures 3.6-inches in total depth, surpassing the stringent Americans with Disabilities Act (ADA ) requirement for protruding objects of less than 4 inches. When combined with the proprietary extended ruggedness and optics bonded front glass and smooth touch surface, Clarity Matrix provides a unique level of ruggedness and ambient light rejection optimized for the rigors of high-traffic spaces. The 1555F range from Hammond Manufacturing is a family of rugged IP 67 sealed enclosures designed for wall mounting PCB-based or DIN rail based equipment such as security components, control equipment and radio repeaters used in harsh industrial environments or outdoor applications. Available in RAL 7035 light gray and moulded in either general purpose ABS or flameproof polycarbonate, the units have a number of innovative features that provide functionality. In use, the lid is secured to the wall or other surface using the slots moulded into the integral flanges. The screws securing the lid to the base are then inaccessible as they are against the surface, giving security against unauthorized tampering. 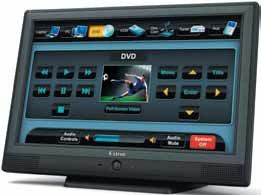 Crestron’s TPM C V-Panels combine the touchscreen and digital graphics engine in a slim design. A widescreen display provides an open canvas for creating 3D effects for control of home theaters, lighting, thermostats, AV networks, security cameras, pool/spa, and many other connected automation systems. 3D GUI animations and gestures navigation create an interactive experience. While simultaneously controlling entertainment and environmental systems in the home, boardroom, commercial building or campus, the 12-inch and 15-inch models feature a slew of built-in apps for enjoying music and movies online, viewing metadata and cover art, browsing the web, and accessing most digital media types, all without requiring a separate computer. Sencore’s 3D video test signals and images for the its MP 500 Multimedia HDMI Generator/ Analyzer enable calibrators to dynamically test 3D display processing and rendering performance using familiar techniques. The images, viewed directly or through activeshutter glasses, enable displays to be calibrated for optimum 3D performance. The 3D HDMI signals can also be used to test HDMI 1.3 devices for 3D signal compatibility. Da-Lite Screen Company’s TWM flat panel wall mounts series has a tilting mount design and allows for adjustment from 0 to 15 degrees, while only protruding 11/16-inches from the wall at 0 degrees. The TWS series is a static mount design, which only protrudes 7/16-inches from the wall. Analog Way’s Smart Edge is a high-resolution seamless switcher with dual output edge blending. Smart Edge offers 10 universal analog inputs including two fitted with DVI and two fitted with HD -SDI . With digital processing, Smart Edge outputs digital and analog signals in SDI , DVI , and VGA. A selection of many formats from HD TV to Computer 2K will enable you to match the resolution of your display device. Smart Edge allows users to create wide blended screens either horizontally or vertically. One unit will handle two video projectors. Multi-Screen Edge Blending can be achieved by linking up to three Smart Edge units, resulting in panoramic image with up to six video projectors without any loss of synchronization. Clear-Com’s Eclipse Version 5.2 marks the beginning of a significant transformation for the Eclipse digital matrix intercom system. The Eclipse Configuration Software (ECS) has been simplified with a new graphical user interface, which facilitates the ease of configuration and management and faster and more efficient communications workflow. Clear-Com upgraded the ECS with new features that automate the setup of intercom communications, reducing operator distraction and improving workflow as soon as users start using the Eclipse system. Gefen’s GefenTV Auto Volume Stabilizer adds digital to analog audio decoding for increased compatibility with stereo systems. Dolby Volume technology is employed so listeners can enjoy the same audio levels when watching TV or listening to music. Noticeable audio spikes and drops are eliminated, delivering a steady stream of audio for a more consistent listening experience. The automated functionality means no more manual adjustment of volume on the remote control. A bypass button is also included for any circumstance in which automatic stabilizing is not required. The TouchMonitor TM7, with a seven-inch touch screen and the TouchMonitor TM9, with a nine-inch touch screen features a redesigned GUI equipped with a touch-sensitive 16:9 high-resolution screen. The unit also comes with an optional digital 3G SDI interface, a feature that television broadcasters, faced with managing new loudness control standards as a result of the continued transition to HD and surround sound, will find especially appealing. Controlled using a finger or a mouse, this touchscreen offers users a new dimension of freedom for positioning and scaling individual instruments. JBL Professional’s MS C1 Control Center Software for Macintosh allows Mac users to take advantage of the JBL MS C1 Monitor System Controllers powerful speaker tuning and software-controlled features. In a compact desktop form factor, the MS C1 Monitor System Controller provides features found in the monitor section of professional mixing consoles including input source selectors, a large volume control, and the ability to listen to two sets of speakers plus a connected subwoofer. Maintaining the quality of digital signals throughout the signal path is an increasing challenge for AV system designers and integrators. Extron recently introduced its DVI 110, a signal regenerator for single link DVI -D signals. The DVI 110 retimes and reshapes marginal or noisy DVI signals, such as those occasionally encountered on the output of consumergrade graphics cards or notebook PCs, or when passive DVI couplers and wallplates are utilized within the signal path. Intelix’s DI GI-VGASD -8X8e is a switcher, which combines Intelixs’ twisted pair extender technology with a comprehensive audio/video matrix. The DI GI-VGASD -8X8e provides eight analog VGA video inputs and eight stereo audio inputs which are distributed in any combination to eight twisted pair outputs. In addition, the matrix interlaces bi-directional RS 232 and IR commands onto the same twisted pair cable, thereby allowing the remote control of the audio-visual destinations connected to the matrix. All of the video, audio, and control signals are transmitted up to 1,000 feet over unshielded twisted pair cable, such as Cat-5 and Cat-6. The matrix supports resolutions up to 1920x1080, features true hi-fidelity audio, and is compatible with thirdparty control systems. Crown Audio’s ComTech DriveCore series of amplifiers offer up to eight channels and 150 watts per channel in a one-unit chassis without a fan. The ComTech DriveCore amplifiers are for a range of fixed installation environments, from video conferencing in boardrooms to luxury suites in stadiums. The line features the Integrated DriveCore technology chip that offers performance boasting a signal-to-noise ratio of 110dB. DriveCore also has feedback and protection circuits integrated into the silicon for fast response. MultiDyne’s SatLink SL -2150 Satellite Fiber Optic Link allows satellite dishes to connect with distant control rooms, network operation centers or broadcast head ends. The SatLink SL -2150 offers an alternative to coaxial cabling in teleport earth stations, and been designed to provide low carrier-to-noise ratio and linear performance. Roland Systems Group’s VR -5 is a fully integrated audio mixer, video switcher with built-in recorder/player for live production and web streaming. This product combines the power of Roland’s audio and video technology into one unit. Typical live events, whether large or small, all require a wide variety of equipment in order to produce. There are audio inputs from mics, audio mixing, video sources to a video mixer, computer inputs, video playback, video monitors, capturing the event in some form, and also streaming it live online. The VR -5’s all-in-one solution simplifies production, recording, and streaming of these live events. Christie’s Mirage Series 3D DLP projector line has expanded with the addition of six models to bring 3D solutions to new markets. The Mirage M Series three-chip DLP projectors offer complete compatibility with 3D standards to support growing demands for 3D displays from home entertainment and video gaming, to museums, education, and rental/staging. All compact three-chip DLP projectors, the six models feature a new dualinput image processor and a wide range of input options to integrate with any 3D signal and format. OSD Audio’s OSD -PA 90 commercial amplifier features 70V, 100V, or eight ohm outputs as well as three microphone input connections with independent volume control for CD players, radios, MP 3 players, iPods, etc. With power handling capability of 60 Watts into eight ohm output mode with less than 1-percent THD +N, installers can connect up to 10 70V speakers. Paired with OSD Audios 70V commercial in ceiling and omni speakers, the OSD -PA 90 is designed for background music and paging for retail stores and commercial buildings as well as outdoor venues. Hitachi’s CP-AW250N ultimate short throw projector features a throw distance of 22 inches at an 80-inch screen when displaying content in its native WXGA resolution. The CP-AW250N offers a high brightness of 2,500 ANSI lumens at a weight of 8.5 pounds and also achieves a high contrast ratio of 2000:1. Hitachi’s new free-shaped lens and mirror improve throw ratio while also making the projector smaller and lighter. In addition, they improve resolution quality, displaying high-definition images.